In a recent post we (Emma Bateman and myself) talked about mains water usage at Sizewell nuclear power plant1. This has created some confusing (not least amongst people working from EDF) which this post is intended to clear up. 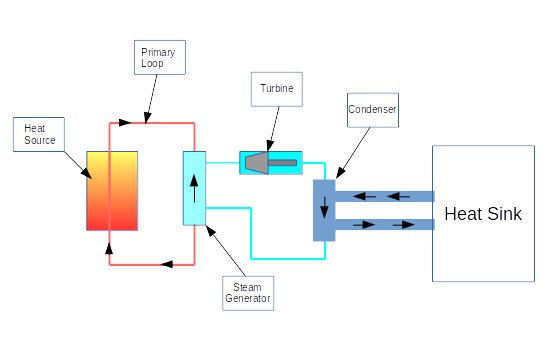 Below is a very simplified diagram of the water flow in a pressurised water reactor (PWR). The heat source (nuclear fuel rods) heats up water which does not turn into steam since it is a very high pressure. This water then passes through a steam generator which heats up water which is not highly pressurised and it turns to steam. This steam then turns a turbine to generate the electricity. On the other side of the turbine the steam is cooled to turn it back into liquid water using a third loop of water. The first two water loops in the diagram – the red and light blue are ‘closed’. That means that the water is ideally recycled continuously. The third loop could be ‘closed’ or as in the case of a power station such as Sizewell it is ‘open’. That means that the water is taken from the heat sink (at Sizewell this is the sea) and then returned rather than being recycled. Water in the first two loops is ideally recycled although this is not the case in practice (see below). In the third loop sea water is withdrawn but then returned at a higher temperate. We therefore have a difference between the water withdrawn – taken and then replaced and the water consumed – taken from the mains supply but not replaced. The maximum amount of seawater which can be withdrawn is 5,011,200m3/day2. This is considerably higher than the 800m3 of mains water which is consumed given for Sizewell B1. What Is Mains Water Used For? The primary and secondary cooling loops are rather like a central heating system. As you may know with time central heating systems clog up and cold spots can appear in radiators. The cooling system is a lot bigger than a domestic central heating system being equivalent to nearly 4 million central heating systems3 and clogged pipes can cause serious problems. To avoid erosion and clogging in the pipework the water is filtered, monitored and topped up when necessary. These filters and others have to be flushed and cleaned using deionized water. Water is also needed for waste treatment and topping up the cooling ponds as well as standard washing, showering and laundry. The exact figures for these vary for different plants. For more detail see the discussion by the IAEA4. This post is very limited in its scope and I have not attempted to discuss the subject of the overall water use for nuclear plants. However, I feel that it is important just to make a few comments at this stage although I may go into subject further in future posts. Nuclear power plants require slightly more water than other thermal plants such as coal or gas (because they are thermally less efficient since they run at lower temperatures) although the difference is significant it is not that much greater. If we want to properly analyse their overall use then we have to include the water used in mining, extraction of uranium from the ore, enrichment etc. In the discussion so far I have assumed that the heat sink shown in the diagram at the top of the post is the sea. However, it can be other things such as a river, lake or a wet or dry cooling tower. These will have quite different water requirements. 3 Waste power is about 2175 MW which is 5.63 x 1016J assuming an 82% capacity factor. Average household gas consumption is 3,938KWh which is 1.42 x 1010J. Therefore the waste heat is enough to heat about 4 million homes. Tritium dilution sounds a bit suspicious … does that mean they just dilute the tritium in water to get it down to the tritium limit in discharges? I think the answer is yes but I will look into it a bit more. I do have a post on tritium from a couple of years ago that I have not finished yet. It would be good to know what the 800 m3 at SB, and the 1,600 m3 at SC, are for. Is this to top up primary and secondary circuits? (in addition to making the tea and other housekeeping functions that can’t use a great deal?) Also, what happens to the waste water, which is presumably of equal volume to input water? — Potable water for air wash plant make-up including filter backwash in tropical regions 200 to 600 m3/d. Variation in the range is due to inlet air dry bulb temperature and relative humidity variations. Any waste water which could be contaminated for example water used for backflushing and cleaning filters/ion exchangers, would have to go through the nuclear waste water treatment system. The rest of the water would go to the normal sewage.